Koh Kron (often called Koh Kon) is a small uninhabited island about 1.5-2 hrs from the mainland. It has two tiny beaches on the east side, the rest being rock that goes down to the sea. The best diving around this island is to the west and south. Visibility ranges from 5-25m, but is usually around 10m. This dive site is characterised by rocks at the water's edge which drop-off gradually at the south end and sharply further north, to a sandy bottom at around 16m. In the shallows, there is a proliferation of dazzling coral and fish life. 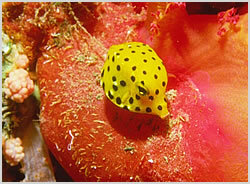 At the south end there are many anemones, box fish, large parrotfish and schools of yellow goatfish. Further north at around 12m there are sea bass, large snappers and sweetlips. This dive site has coral reef from the shore which drops to a shallow sandy bottom at around 9m and gradually goes deeper to the west to a maximum of 14m. Again, there are many brilliant anemones and an abundance of fish life. This is a great spot for a night dive with electric blue-spotted stingrays mingling with moray eels and bamboo and cat sharks. Thanks to Scuba Nation Dive Center for providing this dive site description.